Volcanologists are using a new technique to hear a volcano's internal "music." Life on Earth has always been vulnerable to volcanic eruptions, but modern technology has given scientists several ways to monitor active and potentially dangerous volcanoes before they blow. Now, researchers are unlocking new potential in an existing technique to eavesdrop on a volcano’s “music” — something that could improve the forecasting of eruptions. Volcanologists use what’s known as infrasound monitoring to detect rumblings and explosions inside volcanoes and pick up low-frequency pitches that can’t be heard by human ears. Volcanic activity can deform a crater, which affects the shape of the infrasonic sound waves coming from the volcano. Johnson’s team and researchers at the Geophysical Institute in Ecuador studied the unique shape of infrasonic sound waves produced by Ecuador’s Volcàn Cotopaxi and found that volcanic craters have their own signature “voiceprint” based on their shape. Guatemala's deadly volcano eruption: What is the 'Ring of Fire'? “You can think of a crater as a musical instrument that's forming the tone as well as the reverberation of the sounds that we're recording,” Johnson said. Cotopaxi experienced several eruptions in August 2015, causing its crater floor to collapse. From September 2015 to March 2016, scientists recorded curious infrasound about once a day. They dubbed the sounds "tornillos" — the Spanish word for “screw” — because the sound waves looked like the threads of a screw. The shape of these sound waves indicated that Cotopaxi’s crater had become a 300-meter-deep vertical shaft, creating infrasound frequencies similar to those of an organ pipe, according to the study, published on June 13 in the journal Geophysical Research Letters. The tornillos did not signal an eruption at Cotopaxi, but the study showed a connection between the volcano’s internal geometry and its voiceprint. Johnson’s other study, however, shows how tracking changes in these voiceprints can help scientists forecast eruptions. In that study, published Feb. 12 in the journal Geophysical Research Letters, Johnson and his team tracked the voiceprint in Chile’s Volcàn Villaricca from January 2015 through the spring of that year. 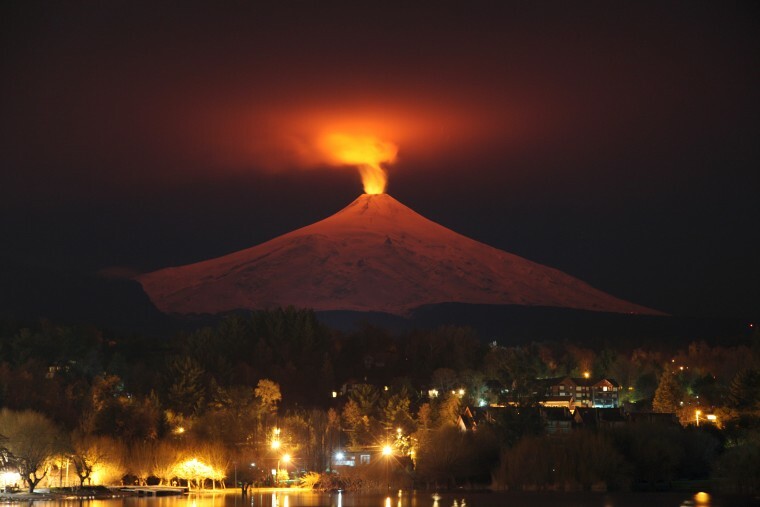 Changes in the voiceprint were caused by a rising lava lake in Villaricca’s crater that filled up over the course of a week before it erupted in March 2015. “You can think of this volcano as a giant trombone and you're pushing in on the piston of the trombone as the lave lake is rising,” Johnson said. With the rise of lava came fluctuations in the infrasound frequencies. Tracking active volcanoes for changes in their internal music could signal to scientists when a crater is changing shape, and thus when a volcano may erupt. For example, infrasound monitoring can detect falling magma levels that cause eruptive explosions, David Fee, a volcanologist at the University of Alaska Fairbanks who is not connected to the studies, told the American Geophysical Union. Einat Lev, a volcanologist at Columbia University’s Lamont-Doherty Earth Observatory, who was not involved with either study, says the technique is “interesting in the fact that it connects infrasound to the geometry and the processes that are happening inside the volcano.” This enables scientists to gather more information about a volcano's internal rumblings than they've been able to before. Both Lev and Johnson said the method could also be helpful in tracking the internal unrest that is driving the ongoing eruption at Hawaii’s Kilauea volcano, which roared to life more than two months ago and has been spewing lava since.